Oven baked turkey nuggets with vegetables hidden inside! 1. Preheat oven to 375°. Coat a baking sheet with cooking spray. 2. In a food processor, combine cauliflower, zucchini, yellow onion and blend to a puree. 3. In a medium bowl, combine pureed vegetables, turkey and ½ teaspoon each of salt and pepper. Roll into 1-inch balls and place on baking sheet. 4. Set 3 medium bowls in line. In the first bowl, mix flour and remaining salt and pepper. In the second bowl, whisk eggs and water together. Place breadcrumbs in the third bowl. 5. Roll balls in flour, then in egg mixture. Toss in breadcrumbs until completely coated; press down to form into a nugget shape. Transfer to prepared baking sheet. 6. Bake for 10 minutes, turn, and continue baking for 8 minutes or until fully cooked. 7. Garnish with parsley flakes. 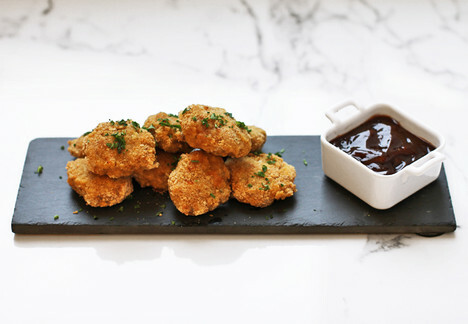 Tip: Serve nuggets with your favorite sauce!